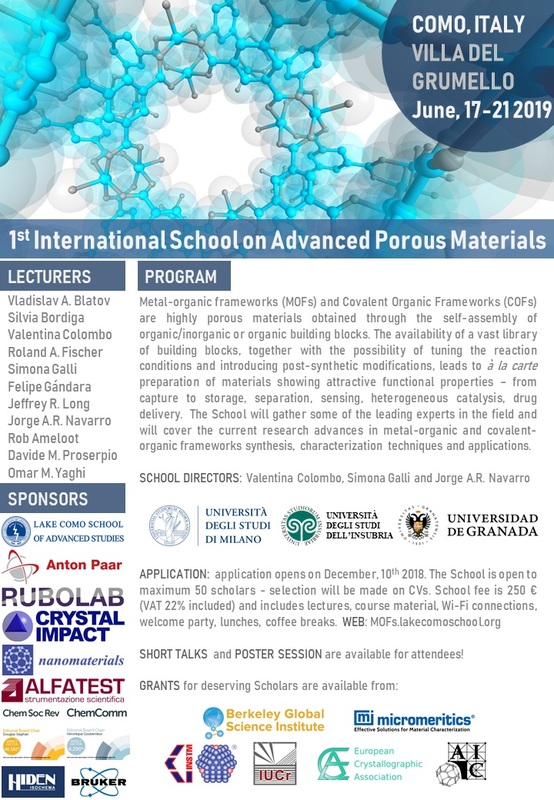 This field of research is progressing very fast, evolving from an initial interest on the synthesis and characterization of these systems to the preparation of targeted advanced porous materials with exotic properties. Advanced porous materials functional properties are of interest to the ever increasingly demanding technological sector. Consequently, unique products based on them are arriving (or will soon arrive) on the market. Yet, there is still a large playground for making new materials and/or improving the properties of existing ones. The MOFSchool, jointly organized by the Universities of Insubria, Milano La Statale and Granada, has made a great effort to encourage participation of young, enthusiastic scientists from any corner of the world, for which we are gratefully indebted to our generous funders. and we are sure you will have a very fruitful and pleasant stay on the amazing shores of the Lake of Como!